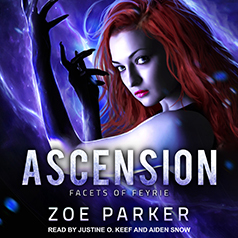 Zoe Parker presents Book 2 of the Facets of Feyrie series. Contains mature themes. I mean yeah, there are perks. Live-in maid service, free food, and I get this purple, sparkly aura thing. But there are way more bad parts. So many people, so much pain. Sleep has divorced me completely, and I'm living their nightmares now too. I'm not sure I'm strong enough for this, that I can do what needs to be done. But I have to. Because it's my job . . . because someone needs to. These people need violence to meet violence. Hugs don't always fix things in our world. Then there's Phobe. Frustrating, Phobe-the-jerk.